Middlesboro Mining, Inc. (“MMI” or the “Company”) is an industrial coal producer with surface and underground mines in Kentucky and Tennessee, providing coal to regional industrial customers. Through long-standing coal supply relationships, the Company has developed a reputation for trust, reliability and consistent high quality product with its customers. The former owners of MMI wound down mining operations, choosing to effectively operate the Company as a coal brokerage. New ownership worked closely with management to restore and gradually increase coal production, while returning MMI to profitability. MMI’s stakeholders have supported the Company through this transition period but sought a new owner to provide the appropriate capitalization to support the strategic growth plan. SSG was retained as the Company’s exclusive investment banker in February 2016. SSG conducted a comprehensive marketing process, contacting a broad range of strategic and financial buyers to achieve an optimal outcome for the Company and its key stakeholders. 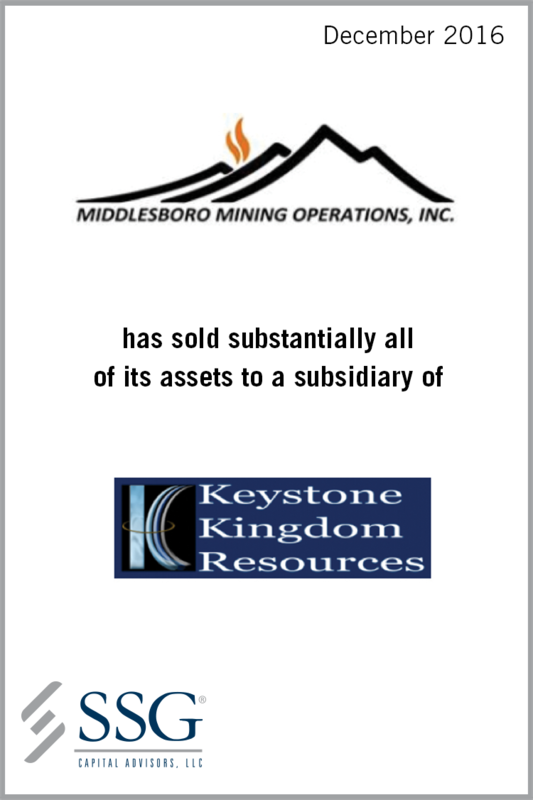 SSG received multiple offers for the business and ultimately determined the highest and best price for all of the Company’s assets was from Double Branch Energy, LLC, a subsidiary of Keystone-Kingdom Resources, LLC. SSG’s experience in identifying buyers and running a thorough, complex sale process enabled key stakeholders to maximize the value of the assets.